The new clinician-designed training series from Span-America supports decision-making for recommended therapeutic technology and appropriate product choices. Company attributes recognition to the leading-edge technology behind its innovative Encore? bed for long-term care. 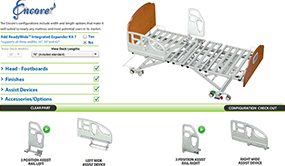 Ergonomic Expander kit for Rexx and Advantage long-term care beds widens sleep surface to 42 inches, fulfilling needs of caregivers and residents alike. Enhanced patient safety and comfort are among the features engineered into Span-America surfaces now available in recessed deck models for acute care. As Span-America continues to expand their bed series, the company announces a new marketing manager for beds and furniture. This team growth comes following the release of the Encore?, their newest bed with special technology for long-term care. The Encore? bed, the newest offering from Span-America Medical Systems, Inc. features state-of-the-art ergonomic design and pressure management technology. Industry expert and longtime veteran of wound care and pressure management joins Span-America as the Manager of Clinical Support.